It’s impossible to overstate the influence that Greece has had on the world as we know it today. From the foundations of democracy to the inspiration for the present day Olympic games, so many aspects of modern life stem directly from this historically vitally important country. These days Greece is also known as one of the premier holiday destinations in Europe, and with so many places to visit in Greece, it’s no surprise that this country welcomes almost 30 million visitors each year! Amazing summertime weather, turquoise blue sea water, the rich and fascinating history and the endless islands are just some of the many reasons that it’s such a popular destination. Despite this, there are still areas that remain virtually undiscovered allowing you to escape the crowds, and Thalatta Seaside Hotel is one of those cherished spots. It’s the perfect place for families or couples to relax in pure luxury, surrounded by the tranquility of the stunning natural environment. Despite being the second largest island in Greece and lying only a short distance away from the illustrious capital of Athens, Evia is relatively unknown to tourists, making it one of the best places to visit in Greece. It’s linked to the mainland by two bridges that span the narrow Strait of Euripus meaning it’s extremely easy to reach. It’s also a favourite secret escape for mainland residents who come to enjoy its spectacular beaches, copious historical sites and diverse culture. 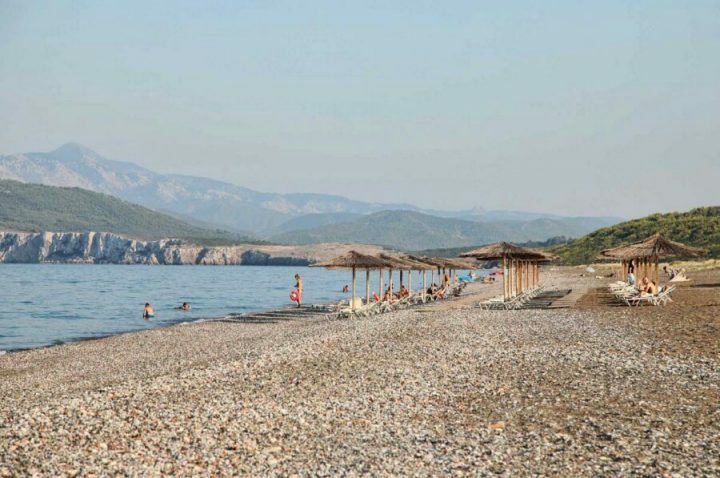 It’s in the northeast corner of this captivating island that you’ll find Thalatta Seaside Hotel, on a long stretch of secluded beach made up of a mixture of pebbles and sand. Thanks to the high proportion of Greek visitors, you’re in for a totally traditional experience on Evia. Unlike a lot of the popular islands in this part of the world, there’s no crazy nightlife, no party scene and no neon lights. Instead you’ll discover traditional tavernas serving recipes that have been handed down over generations, mountain landscapes covered in pine trees and quiet beaches which you’ll have virtually to yourself. 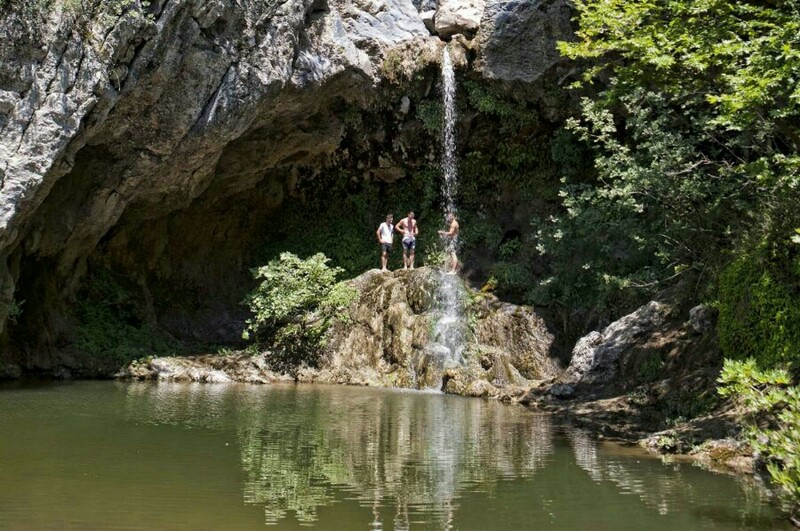 There’s plenty to do nearby though – visit the Drimonas Waterfalls with its refreshing plunge pool below, go for an exciting horse ride, try trekking through the Boulovinenas ravine or do some kayaking in the clear blue seas. 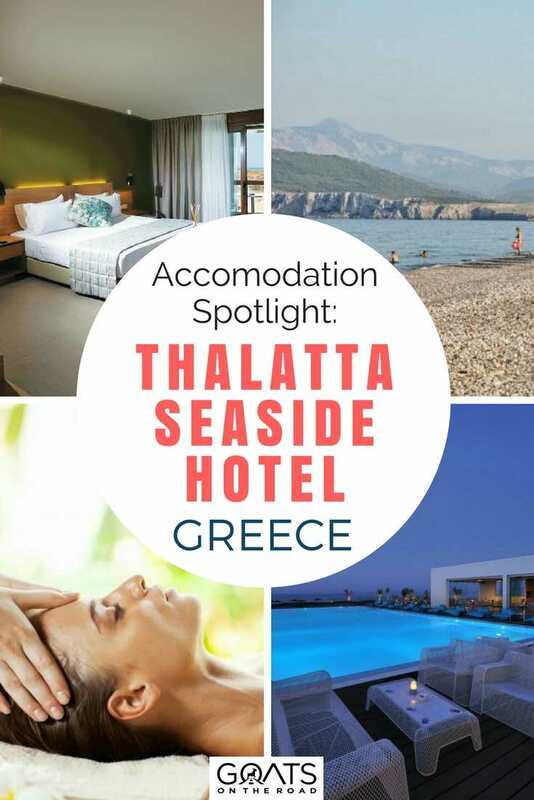 The Thalatta Seaside Hotel offers super stylish accommodations, and overlooks the beach which is just a stone’s throw away. 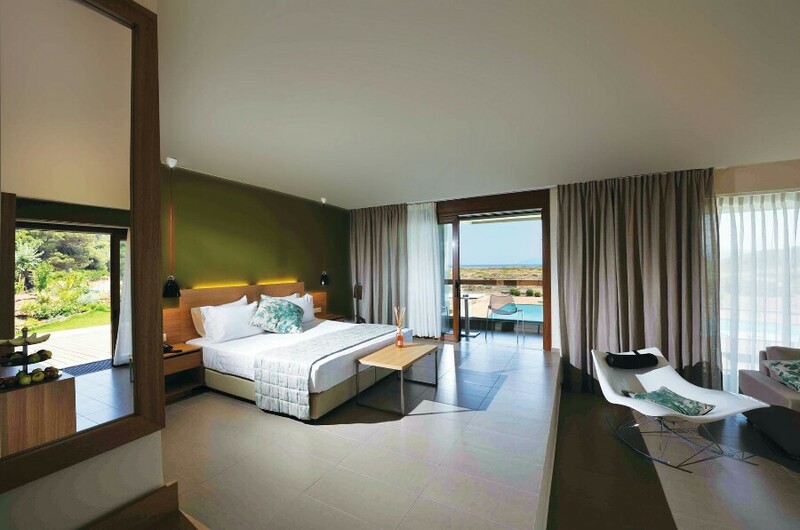 The rooms and suites all feature contemporary design with calming colours and clean lines throughout, with views out to sea or towards the perfectly tended gardens. The largest sized suites even have their own private pools and decks out front along with fully furnished balconies. Whether you’re in a room or a suite, you can expect plenty of space to relax in as well as elegant, contemporary fixtures and fittings that scream understated luxury. Relax by the peaceful pool while reading a book from the outdoor library, or head down to the sun loungers for a day on the beach under the grass umbrellas. If you’re there on a family holiday then there are also plenty of activities to keep the kids entertained, all organised by the onsite animation team. They will make sure that your children are having the holiday of a lifetime, while you enjoy the peace and quiet of the magnificent surroundings. 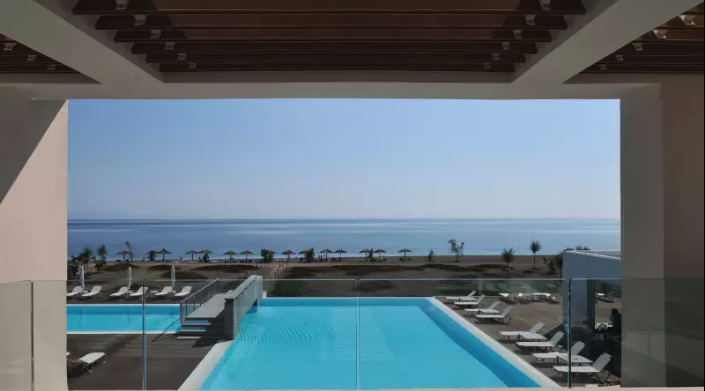 Wellness is a big focus at Thalatta Seaside Hotel so why not take the opportunity to get your body, mind and soul in perfect harmony during your visit. Head to the spa for some well earned indulgence with one of the relaxing treatments performed by the experienced staff including massages, facials and reflexology. You’ll even find a hair salon, for if you’re in need of a mid break trim, or want a new style to show off in your vacation snaps. If you’re a fitness fanatic, join the dedicated Wellness Team for a session of one of the many activities on offer. Head out for an afternoon jog through the lovely surrounding scenery, saddle up for some mountain biking in the local terrain or join in with the relaxing aqua aerobics and yoga sessions. There’s also a well stocked gym so you can keep up with your regular routines and even hire one of the on site personal trainers for that extra bit of motivation. 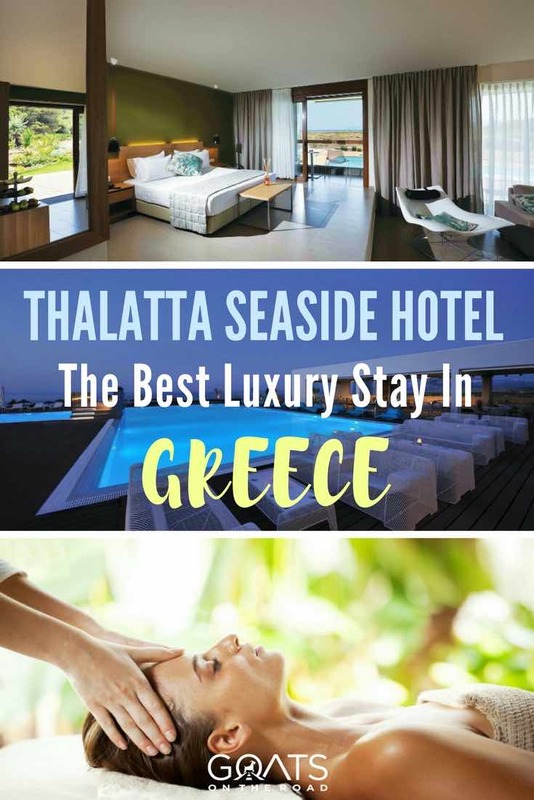 If you can manage to drag yourself away from the pool and the beach, then there are lots of memorable experiences available to take part in at Thalatta Seaside Hotel. There’s a private sailing boat available, ready to take you on a romantic trip around the surrounding turquoise waters, or if you prefer you can arrange a private party on board. You can even head over to explore some of the nearby local islands such as Skopelos and Skiathos that lie in the Aegean Sea, it’s entirely up to you. For fans of wine, there’s a fantastic wine tasting experience which allows you to try some of the best vintages made right there in Greece. Experience the magic of watching your favourite movie out in the open on a giant screen on the beach, with a private screening under the twinkling night sky. 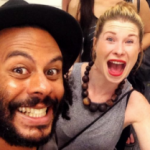 Ever wanted to experience the high life of a model? Or maybe you just fancy getting your hands on the best holiday snaps going. You can hire a photographer to arrange a professional shoot in the picturesque settings of the hotel and get an intoxicating taste of the glamour and glitz. 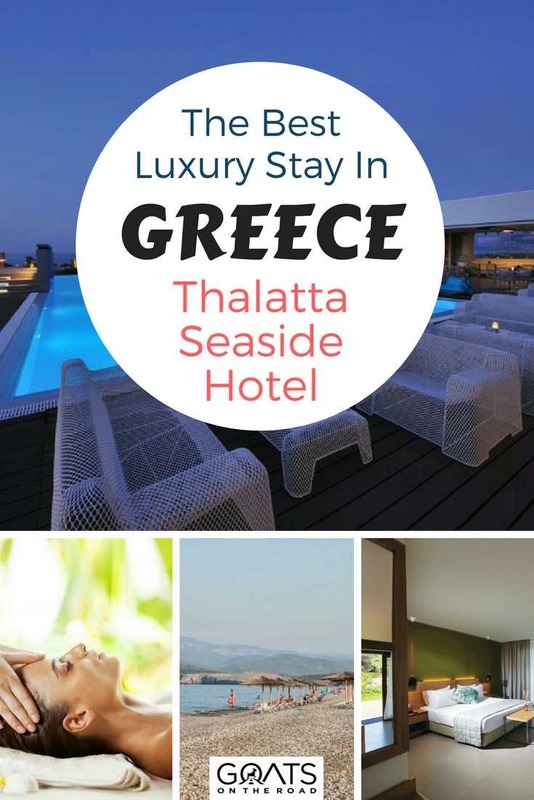 Thalatta Seaside Hotel has three top class restaurants to suit every occasion, as well as a lounge bar and the option to dine in private on the balcony of your suite or on the beach. 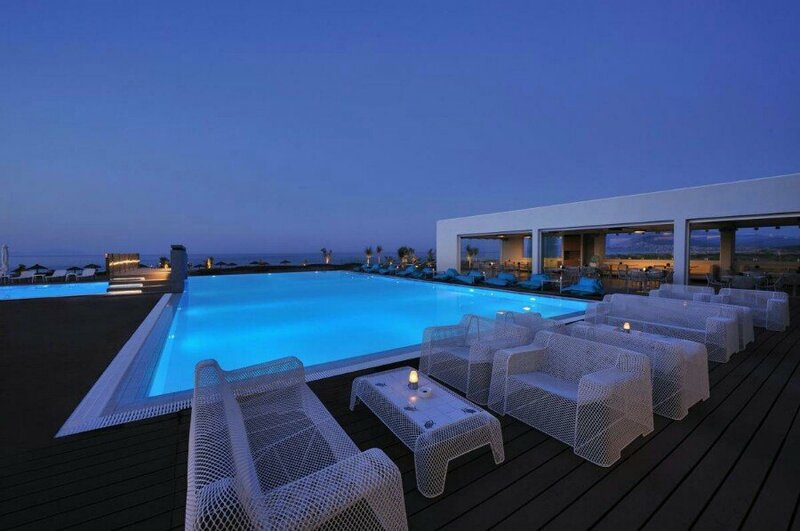 Sample a traditional Greek buffet at the Asado restaurant, dine out on the freshest high quality seafood while sitting on the beach at Meze or enjoy slow cooked mediterranean dishes at the newly opened rooftop Baxe restaurant. Thalatta is famous for the excellent service that guests receive throughout the duration of their stay. From the 24 hour concierge and room service to the convenient babysitting facility, you’ll be looked after from start to finish by the fabulous staff. This is one of the top spots for a luxury getaway in the whole of Greece, it’s no wonder it’s known by the locals as one of their best kept secrets. Planning to visit Greece in September. Thanks for this write-up! And I like that this hotel has a spa because that’s what I always look for in every hotel. Bookmarking this post as a future reference.